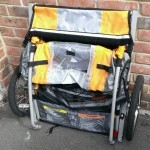 Currently £130, the Double Buggy holds two children up to 22.5kg each (or 50 lbs). 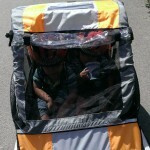 Constructed from steel frame with a fabric child compartment, it’s a sturdy contraption. It folds away nearly flat (once the wheels are removed) or if you’ve a bit more room you can leave them attached like I do. Everything clips together with steel pins (with safety locks), so you don’t need any tools to put it up or down. 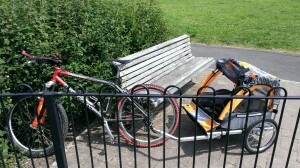 The Trailer attaches to the bike with a universal clip that goes over the axle or quick release. I was initially a little worried about this as I have cheap alloy quick releases on my bike, but I experienced no issues. There is also a secondary safety clip, just in case. The children sit on the fabric seat/floor, with safety harnesses to secure the children. Although the steel frame forms a cage around them, they should still definitely where cycle helmets – its a good time to get them used to them as well. It looks as though there isn’t quite room for two children, and they are close together, but not uncomfortably so. In fact my two didn’t complain at all – and that’s rare! You should just about be able to see them inside. The front cover is mesh, with a clear plastic screen that can go over the front, or be rolled up out of the way. I think the whole trailer is best described as splash, rather than waterproof. You will be able to stop water spraying in the children’s faces, but other than that there’s going to get a bit wet if it rains. So you could get home with them, but don’t start off in the rain, unless they’re in waterproofs inside. Once connected up, its time to ride. There is a small amount of adjustment you need to make to your normal cycling technique – essentially slow and smooth. This is purely for your children’s comfort – if you accelerate away suddenly you’ll give them whiplash! You also need to be aware of the weight you’re pulling. It’s unmistakable when you pull away, but it also adds push and momentum that you don’t normally have, so remember to brake early. 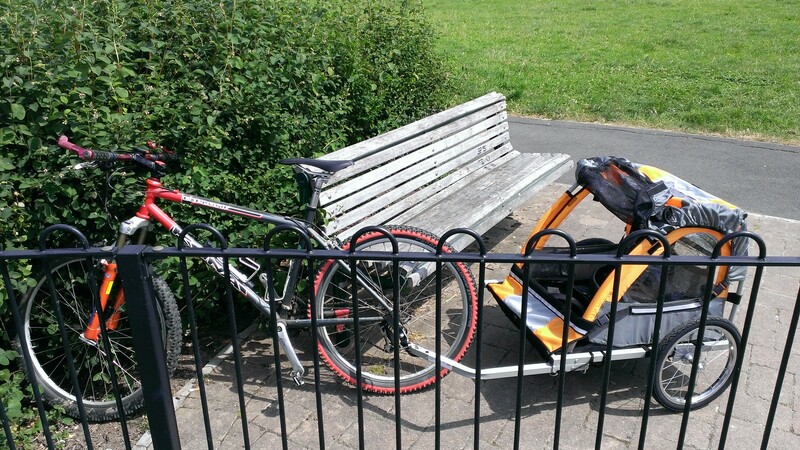 Other than that though, its great – you pedal, and the kids come with you. 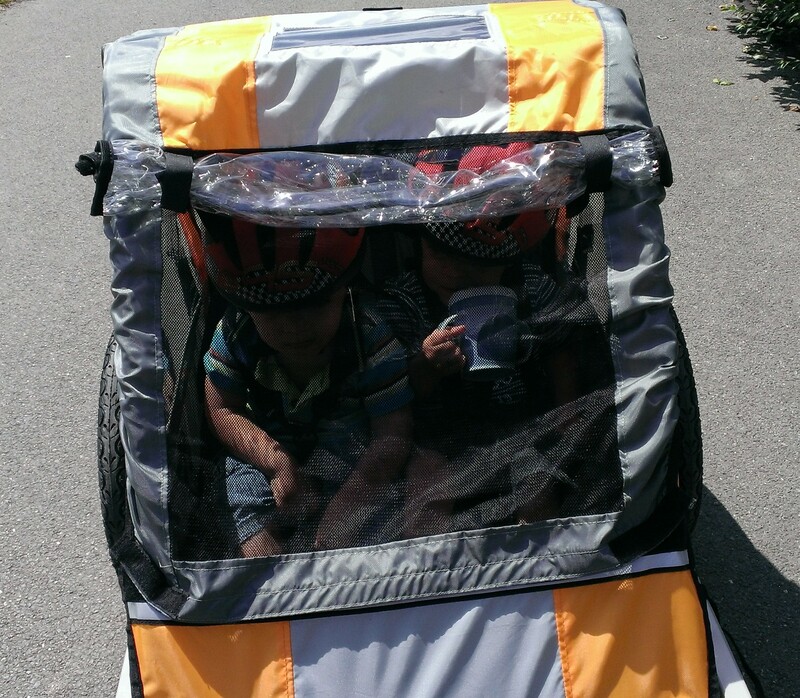 My boys weren’t sure about going in it initially, although that could have been mainly down to the helmets, but once moving they absolutely loved it and I had no problems getting the back in the second time. In fact the only issue I had was when I stopped and they shouted at me to keep going. You won’t need a personal trainer! I’m rather impressed with the trailer in all. It’s reasonably priced, especially compared to some others, folds up so it fits in a boot, works well and does what it’s supposed to. It is a bit heavy, but then its box framed steel for safety, not racing, and the weight of the kids is still the biggest factor. Only real criticism is maybe it could do with better seats, but that’s me thinking that – the passengers never complained. (Next Post) Research your trail before you ride it!